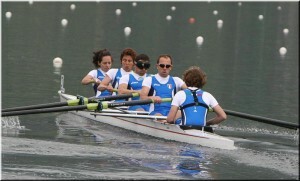 The boat is designed for four rowers Adaptive. The hull is composed of honeycomb carbon and Kevlar textiles, arranged to form the sandwich structure. The rowing deck is produced, using carbon textile, prepregnated and cooked in autoclave and under vacuum pressure. The hull and its components are subjected to catalyst processes (hot and airtight processes) that provide an excellent result in lightness and stiffness. The internal components (ultralight carbon trucks with ball bearing chassis, rowing deck, bulkhead etc) are manufactured using prepregnated carbon, baked in autoclave.